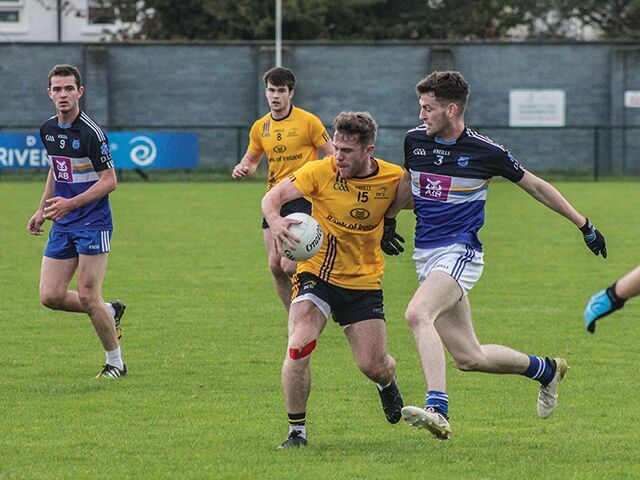 DCU held on for a three-point win in Parnell’s GAA grounds against DIT in their Division One clash, which saw the early departure of referee Gary McCormack in a collision in what was a physical game. From the throw in, DIT midfielder Sean Hurley sent in a quick high ball to corner forward Cillian O’Gara who opened DIT’s account. DCU replied soon afterwards as Diarmuid Murtagh fisted over following a one two with corner forward David Mannix. Six minutes had gone when referee Gary McCormack collided with DCU and DIT players resulting in the match being postponed until Sean Fox stood in as referee. Eanna O’Connor made a lung-busting run from the 45-yard side-line, riding three challenges before chipping over a well worked point. The driving runs of O’Connor were matched by the long-range shooting of Shane Carthy, as he pointed with the inside of the left from 35 yards out. Thomas Gaughan then slotted over a point with his right boot after an impressive counter attacking move. Cian Breheny joined the attack for DCU slotting a patiently worked point making it six points to two points half way through the first half. A missed DIT goal chance was punished emphatically by DCU’s Mannix as he produced another on the turn point on his right boot near the side line, leaving the DIT defence frustrated. However, points from Hurley, Loftus, and O’Gara narrowed the margin to two points, with Hurley’s point coming straight after he won a mark and ran through DCU’s defence. For the remainder of the half DCU were in control, with Rory O’Connor adding a point and Mannix doing an exhibition in long range shooting with a signature on the turn and one from outside the 45. The half time score read DCU 0-11 DIT 0-05. DCU’s centre forward seemed to seal the inevitable with an outrageous outside of the left effort from 30 yards out as the match resumed. Some fine shooting from Conor Loftus, Shane Dempsey, and Con Cavanagh couldn’t rein in DCU, as Mannix sealed the win with the insurance point a minute before time. The senior footballers will now go on to face Trinity College, where a victory will ensure a home draw for the quarter finals. “We’ve a good squad and I think the players adapted very well to the change in referee in a physical but very fair game” said coach Dermot Sheridan.